Honor has launched Honor 7C smartphone under Rs 10,000 at this price point there are other phones like Redmi Note 5, Redmi Y2 and Realme 1. Let's do Design, Features, Camera Comparison between Redmi Note 5 (Redmi 5 Plus) and Honor 7C. Both phones have a metal body, fingerprint scanner on the rear. On Display Honor 7C has 5.99-inch (1440 × 720 pixels) HD+ 18:9 2.5D curved glass display whereas Redmi Note 5 comes with 5.99-inch (2160 × 1080 pixels) Full HD+ 18:9 display. Honor 7C is powered by Snapdragon 450 processor compared to Snapdragon 625 processor on Redmi Note 5 which is better. Both phones come with 3/4GB of RAM and 32/64GB of internal storage, Honor 7C has dedicated microSD slot which lacks in Redmi Note 5. On Camera Honor 7C has a 13 MP rear camera with LED flash, secondary 2MP camera, and 8MP front-facing camera, Rear Camera can record 1080P videos whereas front camera 720P. Redmi Note 5 has a 12MP rear camera with dual-tone LED Flash, 1.25μm pixel size and 5MP front-facing camera which lacks Dual Rear Camera and Depth mode. Daylight Images on both phones are good front Camera Honor 7C is better when it comes to Lowlight Redmi Note 5 is better. 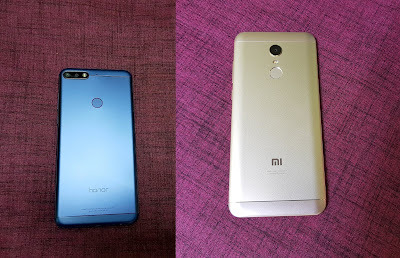 Honor 7C runs on Android 8.0 Oreo whereas Redmi Note 5 runs on Android Nougat. Honor 7C comes with 3000mAh battery whereas Redmi Note 5 has 4000mAh battery both phones do not support the Quick charge. Battery life on Redmi Note 5 is better.